One of the often criticised goals from the original Auckland Plan, and subsequently the Unitary Plan was the council’s desire for a 70:40 split in housing development. Translated, they essentially wanted 60-70% of all growth in housing to occur within the existing urban area. The intensification that was to occur was also to be focused around our emergent Rapid Transit Network, currently composed of the rail network and the Northern Busway. The critics of those goals often argued that they were unrealistic, that people didn’t want to live in apartments or terraced houses but wanted stand-alone houses on large sections. 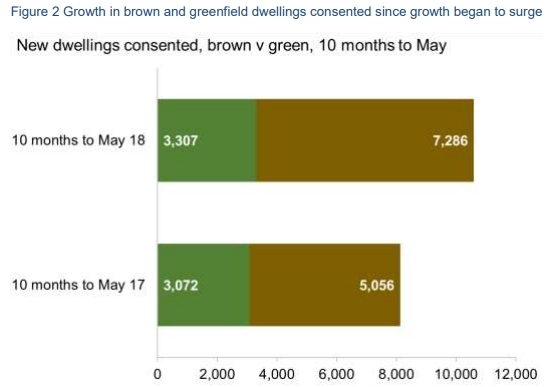 The result being that they believed we should open up more greenfield land for development. This view was often part of a circular argument as they opposed changing or removing highly restrictive rules, such as height limits, view shafts, minimum parking requirements and setbacks that prevented more intensive developments and then would use the fact not many were being built as proof they weren’t wanted. Thankfully the commissioners hearing the Unitary Plan didn’t agree and near the end of 2016, the plan was adopted and allowed for much more housing development. A report to the Council’s Planning Committee next week shows that the Unitary Plan is doing exactly what it was intended to do. It shows that building consents had slowed in the six-months prior to the adoption and it took until about August 2017 to really see any impact, but since then, things have been increasing significantly. But it’s also where those consents are that are important and they say. 90% of the growth in consents is in Brownfields areas, accounting for 69% of consents, up from 62% for the same timeframe a year earlier. 54% of consents are terraced houses and apartments, up from 37% in the same timeframe before the Unitary Plan was passed. That number rises even higher when looking just inside the urban area where this number is 66%. They point out that this is “precisely what the Plan aimed to deliver“. 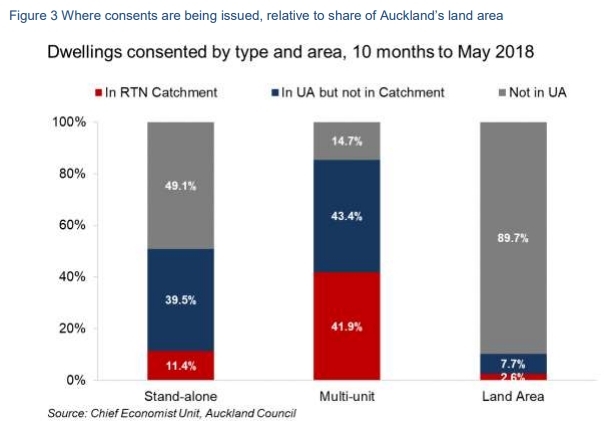 11 per cent of stand-alone homes were consented in rapid transit network catchments. This is 4.3 times more than the catchment’s share of land area. 81 per cent of all dwellings consented in rapid transit network catchments in the last year were multi-unit, helping to deliver the intensification that characterises transit-oriented development. 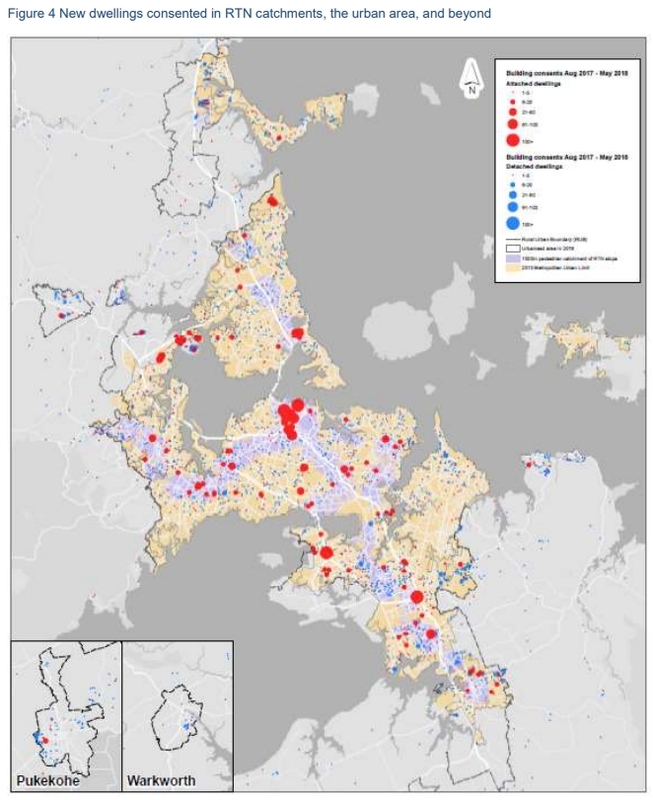 Overall, 40 per cent of all dwellings consented in the urban area were in the rapid transit network catchments, even though the catchments account for only a quarter of Auckland’s urban area. This map is a bit blurry but from what I can make out, the red dots are consents for intensified typologies and the blue ones stand-alone houses. The size of the dot denotes the number of consents at that location. There’s lots of everything happening in Upper Harbour, which incorporates the Hobsonville Point developments. Unsurprisingly. 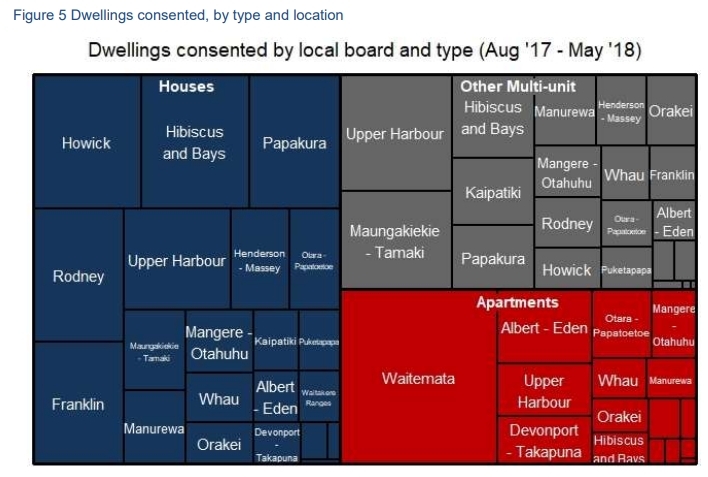 most apartments are in the Waitemata Local board area or the local board areas surrounding it (including over the shore in Devonport/Takapuna). Overall there appear to be some really positive trends emerging with consents and Auckland is transforming before our eyes. Take a bow Gen Zero, Greater Auckland, and all those who gave support for it. Excellent news, Matt, and great data to have. So it is possible, and the plan is effective. Now the mechanism is in place, and more developers and communities are getting on board with multi-unit development, let’s use that now to shift it to a more sustainable split. Strong case here then for the rapid expansion of the Rapid Network. Which of course is also the plan. Clearly with both more widespread and better Transit all housing demand can be met within the existing urban area while increasing the city’s efficiency. Its a wonderful thing, seeing the unitary plan in action. Intensification near rapid network, none more so than the new development right on Glen Eden rail station. Somewhat incongrous some might say as it sits in middle of low risen village, but it is the future of housing and PT. I had pondered on the future for the old P&R carpark just opposite. Activity when that tyre retailer was demolished, perhaps that awkward road junction into the mall was getting sorted at last, or could something be underway to redesign/remove the level crossing? Fond hope, the result of that activity? Just what we needed, right plonk in the middle of the village, a spanking new self service Gull petrol station. Clearly the two existing petrol stations within 300metres of this new one were insifficient or just too inconvenient. Yes, a wonderful thing this unitary plan, can we expect more petrol outlets right next to RT stations? What was that land zoned for? Was the land contaminanted? Those questions might help answer your interesting observation. Clearly someone thought there was money to be made opening a petrol station there, that’s why it was done. A self service petrol station is a relatively low cost development to get a return on the land awaiting until a more expensive development can be justified. Certainly suggests Council should be able to direct land uses more. Similar thing in Pt Chev. If I’m to believe the digger driver doing the demolition, a car yard has just been demolished to build a new car yard, on the town centre’s main block. Sorry, but commercial rights be damned – that doesn’t support good urban form. An observation from London (which I return to every couple of years for a holiday, so the differences are easy to spot): Almost every petrol station in the suburbs has been converted to blocks of flats (often with a ‘Tesco metro’ or equivalent compact supermarket at ground level). This started about 10 years ago and is still continuing with the last few remaining ones. Across London this must have been thousands of them. Making up for any shortfall, most (full-size) supermarkets now have a petrol station in their carparks. Sooner or later some or all of those three petrol stations you speak of will become valuable for redevelopment, even if not just yet. Yes, here’s an example of that: https://www.theguardian.com/business/2018/jul/29/discount-grocer-lidl-plans-build-3000-homes-school-planning-permission-new-stores .. For example, the Warehouse could use that approach for its site at the junction of Dominion and Balmoral Roads. Great captive market for its store, and more housing units near frequent bus services- win-win all around. The warehouse looked at developing that exact site about 5 years ago but had very strong NIMBY opposition. Apparently they preferred a large at grade car park over homes and shops. The main reason they’re thriving is that West Coast Road is a substantial gateway into the city for the urban sprawl west of city. However, I do find it extraordinary that the UP rules have resulted in a petrol station in the absolute heart of a town centre, adjacent a rail station. If the site wasn’t contaminated before it certainly will be now. Clearly it also generates next to zero interns of local employment. This kind of civic vandalism should be actively prevented by the UP rules. Imagine how nice GNR could be with blocks of apartments replacing all those car dealerships. That could actually be a truly Great road. +1 With wide footpaths that the business owners don’t park all over, and some trees… let’s hope it happens in my lifetime. Make Great North Road great again. Let’s not forget that the terrace houses being built are still hideously expensive. There needs to be even more of a push so that there’s better choice, build options and value for money. Exactly. It’s all well and good to see lots of townhouses and apartments getting consented (how many actually get built is another question) but how bout those price points? These results are a good start, but much more needs to be done. In many areas the densities are still not anywhere near high enough. Height rules need to be much more enabling in many locations. A 7 storey retirement village was recently declined in Meadowbank. Assessed against the unitary plan zoning that was probably the right decision.But it highlights why for bigger sites (including multiple smaller sites that are amalgamated) we need much more height enabled. We need lots of 50-200 unit schemes developed, rather than lots of 5-30 unit schemes. Auckland must do all it can to support our businesses. Encourage more tourists, students, business start ups. Reduce our biggest import cost that is oil. Surely the proof of the Unitary Plan pudding has to be lower housing prices? No Stu the Unitary Plan is perfect. It is mission accomplished. There is no need to worry about homelessness or essential workers being priced out of Auckland or price to income ratios being way worse than most other cities….. Sometimes I wonder if GA understands social justice issues at all. It certainly seems to be tone deaf to many Aucklanders struggles at times. I can’t see anywhere in here that says the unitary plan is perfect and will never need changing, or that is has solved all of Auckland’s problems. I think you might be reading too much into it. It would be quite impressive to solve a decades made housing crisis in two years. The unitary plan is doing its job much better than any predecessor. Other key tools to fix the housing crisis (such as kiwi build) wouldn’t be possible without the unitary plan. As urbanists we are often in opposition to the popular political narrative for so long that we forget to celebrate our wins. Now its time to win bigger. Auckland house prices have not risen since the Unitary Plan was passed. 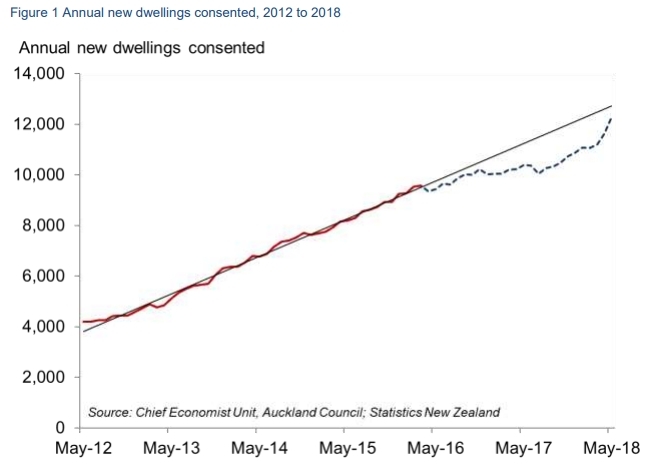 That stands in contrast to the trend elsewhere in New Zealand, which suggests that local factors (which could be supply- or demand-led) rather than national factors (such as Reserve Bank limits on mortgages). While it’s probably too early to make firm conclusions about whether the Unitary Plan caused the change, I’d tentatively suggest that it has done some good for housing affordability, or at minimum avoided worsening it. Thanks for the links Peter. I believe that the Unitary Plan is helping. I just don’t think it has gone nearly far enough. Housing not getting any worse is a low bar goal. I think an interesting index to watch amongst those various urban capacity indicators is the land value as a percentage of house value. If the Unitary Plan is achieving its goal of affordably transitioning Auckland to housing more people, in better built environments, that are within walkable distances of amenities like rapid transit, town and city centres etc then more capital (houses) should be substituted for less land -more taller housing types using less land per residence. So far there is no evidence that land values as a percentage of house value is falling though. So I wouldn’t call it mission accomplished yet. But it is early days….. If land and house values could stabilise. And new houses in existing neighbourhoods could be built more affordably because more houses on less land, without inflating land prices. That would be the most painless way to transition to affordable housing. P.S I think to achieve this planners/councils need to do more than just make planning restrictions less restrictive. I think we need to go back to first principles -planning restrictions are there to manage nuisances, where land-use actions affect the neighbouring properties around it. So planning/councils have well developed mechanisms for managing ‘bads’. But city building also generates ‘goods’ and there doesn’t seem to mechanisms whereby individuals, neighbours and small groups can maximise those ‘goods’. For what it is worth -that is theory behind this proposal. I’m wondering what that percentage should be. 50/50, as it is now, sounds very high. And even then: I opened the GIS viewer and drawed an arbitrary rectangle somewhere in the inner west. The typical lot is 400 to 500 m², and the land value of that lot is around 1.5 million. It is also zoned single housing zone. You’re not even going to make it to 50/50. I think this is a case where even lay men can tell this is totally FUBAR. Maybe zoning should be based on land value. What can you build on your lot at, say, 4 times the land value? I think the land value should be about 30% of the total house value. That is roughly what it is for greenfield development. Builders/developers tend to build houses that are about 2-to 3 times the land costs i.e it doesn’t make any sense to build a cheap house on expensive land (as measured per building plot). Brownfield developments to be competitive need to target that sort of ‘relative’ land value. In my paper ‘Great Design Can Help Solve the Housing Crisis’ that was achievable in Auckland’s western rail corridor in a way that gives a economic payoff to existing house owners (which is needed or none of them will not participate in such schemes) and provides new housing at KiwiBuild price points -so should be desirable for first home buyers. Yep, that’s a useful metric to keep an eye on. The challenge in interpreting short-run movements, though, is that adjustment via increased development will be *slooooow*. (Adjustment via crashing land prices could be quite rapid, but let’s set that aside for now.) If you assume that buildings have a 30-50 year lifespan before they need to be redeveloped or substantially renovated, then it implies that somewhere in the range of 2-3% of existing sites will come up for redevelopment every year. Even setting aside zoning, not all of these sites *will* be redeveloped. Some will be awkwardly shaped or encumbered by cross-leases, while others will have owners who prefer to refurbish (which will raise the improvement/land ratio, but not as much as you’d like). Or, to put it in other terms, it would take at least 25 years to get from a building/site value ratio of 40% to a 70% ratio using incremental redevelopment alone. And that’s a best-case scenario that assumes away zoning, refurbishment of existing properties, site constraints, etc! However, I don’t see that as a problem for your proposal. It took 25 years for Auckland’s building/site value to drop from 62% to its current value of 32%, so maybe it’s not crazy to expect it to take a similar length of time to unwind that. Well of course the average moves slowly. But you can calculate the average over things built over eg. the last 3 years. That metric surely can move a bit faster. Another useful variant is what would it be if this site was built up to the maximum allowed by the zoning? We can also start with a ratio and work out how much buildings we would build to reach that ratio. Brendon said 30/70, let’s go with that. Which zoning would make sense in our example at Grey Lynn? Your budget (per site) is 3 million. That’s going to work out to something way more substantial than single houses. Or even townhouses. Yes – that’s a good point. Always useful to look at things on the margin! Given that the whole residential housing system is a tax rort, the unitary plan won’t do that much to house prices. As long as the tax loophole exists, landlords will keep buying up all the houses because they have the equity that first home buyers don’t. It just pushes the prices up. It also just encourages developers to continue building easy to build houses that landlords will by for the long term capital gains. Put an annual tax on capital and watch the housing market deflate. Or implode as tax cheats sell up. Either way is fine. It will lead to developers building things that people other than landlords want. I say this as a person who owns a few houses already. Last year my houses increased in value by a few multiples of my salary. All tax free. The system is broken and needs to be fixed and allow wages to catch up.